Update, August 22: Geralt is unlikely to feature as a protagonist in Gwent, because the story diverges significantly from what it means to be a witcher. Previous trailers for Gwent included Geralt, but the one for Thronebreaker doesn’t show him at all, and actively distances the campaign from witchers in general. Jakub Szamalek, principal writer on Gwent and senior writer on The Witcher 3, says that’s because Geralt as a character doesn’t really fit the narrative theme of Gwent. The Witcher 3 makes it onto our list of the best PC games. “After we realised that [Gwent] was coming together pretty nicely, we were thinking of what other characters to showcase. There have been nine books, and three games, and numerous comic books, so I think that things would start getting repetitive if we put Geralt at the front again. And also Geralt is not a great character to lead an army across a few months, because he’s a lone wolf, he works on his own. Having a long campaign where you have Geralt as the main hero would probably be difficult to justify,” Szamalek tells us. On the other hand, “you can try to steer her towards a more merciful and magnanimous side.” She’s very different to Geralt, who was “supposed to remain neutral” throughout The Witcher trilogy, whereas Meve “has a very strong interest in promoting her side, and behaves in a very different way from Geralt,” something that will become clear in the game. 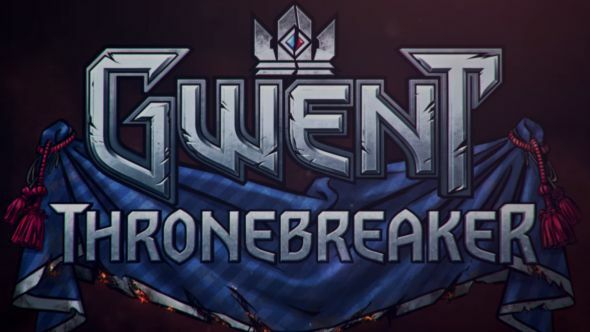 Original story, August 22:The first story campaign for Gwent, the standalone version of The Witcher 3’s lauded card game, will be called Thronebreaker. Thronebreaker tells the story of Meve, the queen of two of the Northern Realms. Meve’s kingdom is facing a foreign invasion, and she’ll be fighting for what’s been taken from her. Developers CD Projekt Red say the story will take players to areas of the world of The Witcher that have never been explored before, in a campaign containing its own story quests and battles. They say that the missions are intended to play with the rules of the game “in wildly unexpected ways,” which sounds a little like Hearthstone’s tavern brawls or its One Night in Karazhan expansion. The story mode will also include other mechanics, such as resource gathering.